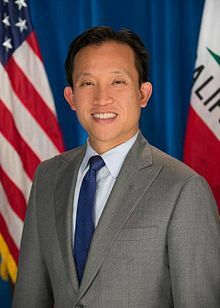 David Chiu (Chinese: 邱信福; pinyin: Qiū Xìnfú, born April 2, 1970) is an American politician currently serving in the California State Assembly. He is a Democrat representing the 17th Assembly District, which encompasses the eastern half of San Francisco. Prior to being elected to the Assembly in 2014, Chiu was the President of the San Francisco Board of Supervisors and Supervisor for District 3, encompassing the northeastern corner of the city, including Chinatown, North Beach, the Financial District, and Fisherman's Wharf. Chiu is the current chair of the California Asian & Pacific Islander Legislative Caucus. He was the first Asian American to serve as District 3 supervisor, the first Asian American to serve as board president, and the first supervisor elected to three consecutive terms as board president. The eldest child of Hakka Taiwanese American immigrant parents, Chiu was born in Cleveland, Ohio and grew up in Boston, Massachusetts, where he attended Boston College High School. Chiu graduated from Harvard University, where he received a bachelor's degree in government from Harvard College, a master's degree in public policy from Harvard’s Kennedy School of Government, and a Juris Doctor degree from Harvard Law School. In the mid-1990s, Chiu served as Democratic Counsel to the U.S. Senate Judiciary Committee’s Constitution Subcommittee and aide to Senator Paul Simon to the Senate Budget Committee. After moving to San Francisco in 1996, Chiu worked as judicial clerk, as a criminal prosecutor at the San Francisco District Attorney’s office, and as a civil rights attorney at the Lawyers' Committee for Civil Rights. He later founded Grassroots Enterprise, an online communications technology company, and served as its chief operating officer. He also served on the San Francisco Small Business Commission until he was elected supervisor in 2008. Chiu first ran for elected office in 2008, when he ran for a seat on the San Francisco Board of Supervisors representing District 3. He was backed by incumbent supervisor Aaron Peskin as well as Kamala Harris, Mark Leno, Leland Yee, and Tom Ammiano. On his first day in office on January 8, 2009, Chiu was elected to a two-year term as president of the Board of Supervisors. He was reelected board president on January 8, 2011. Chiu was reelected to his second and final term as supervisor in 2012, winning over 75% of the vote. He was later reelected by his fellow supervisors to serve an unprecedented third term as president of the board on January 8, 2013. In addition to serving on the Board of Supervisors, Chiu also served as a member of the San Francisco Democratic County Central Committee. On January 10, 2011, Chiu served as acting Mayor of San Francisco for a day after Gavin Newsom was sworn in as Lieutenant Governor of California, prior to the selection and swearing-in of Ed Lee by the Board of Supervisors. On February 28, 2011, Chiu announced his mayoral candidacy at a morning rally at San Francisco City Hall. Over the course of the campaign, Chiu raised over $1.24 million from both private and public sources and spent roughly the same amount. On September 12, 2013, Chiu announced his candidacy for the California State Assembly to replace termed-out Democrat Tom Ammiano in the 17th district, which encompasses the eastern half of San Francisco. He ran against fellow Democrat and supervisor David Campos. On January 22, 2014, the San Francisco Chronicle column "City Insider" reported that Chiu reported having raised $450,000 for the Assembly race. Polls showed him ahead of Campos. Chiu beat Campos in the San Francisco primary on Tuesday, June 3, 2014, by approximately five percentage points. Chiu won 48% of the vote, while Campos pulled in 43%, and Republican candidate David Salaverry won 8.5%, meaning the November election would be between Chiu and Campos. On November 4, Chiu defeated Campos with 51.9% of the vote, and Campos conceded on November 6. David Chiu was appointed by Speaker Toni Atkins to serve as assistant speaker pro tempore in the 2015–16 session. The assistant speaker pro tempore is the third highest ranking position in the state assembly. ^ Lagos, Marisa (October 24, 2013). "David Chiu ties the knot". San Francisco Chronicle. Retrieved July 22, 2015. ^ a b c d Lagos, Marisa (January 11, 2013). "New head of S.F. supes seen as no pushover". San Francisco Chronicle. Retrieved September 14, 2013. ^ a b Sabatini, Joshua (January 8, 2013). "David Chiu retains presidency of Board of Supervisors for third term". San Francisco Examiner. Retrieved September 14, 2013. ^ Lagos, Marisa (November 29, 2009). "Gentle manner makes Chiu stand out at City Hall". San Francisco Chronicle. Retrieved September 15, 2013. ^ a b Gordon, Rachel (October 3, 2011). "David Chiu plans middle path to SF mayor's office". San Francisco Chronicle. Retrieved September 15, 2013. ^ Letzing, John (December 23, 2010). "Mayoral Vacancy Raises Odd Prospects". Wall Street Journal. Retrieved September 15, 2013. ^ Sabatini, Joshua (September 16, 2012). "David Chiu has drawn critics while occupying middle ground". San Francisco Examiner. Retrieved September 14, 2013. ^ San Francisco Labor Council. "David Chiu for Supervisor 2008 - Mailer 6" (PDF). San Francisco Usual Suspects. p. 3. Archived from the original (PDF) on 2011-07-21. Retrieved September 14, 2013. ^ Gordon, Rachel (January 8, 2011). "David Chiu keeps Board of Supervisors presidency". San Francisco Chronicle. Retrieved September 14, 2013. ^ "The DCCC". San Francisco Democratic Party. Retrieved September 15, 2013. ^ Bay City News (January 11, 2011). "Supervisor David Chiu keeping low profile as mayor for a day". San Francisco Examiner. Retrieved September 15, 2013. ^ Gordon, Rachel (February 27, 2011). "David Chiu set to enter the mayor's race". San Francisco Chronicle. Retrieved September 15, 2013. ^ Shaikh, Shaista. "Report on San Francisco's Limited Public Financing Program - November 8, 2011 Mayoral Election". San Francisco Ethics Commission. Retrieved September 15, 2013. ^ Latterman, David; Corey Cook. "November 2011 preliminary RCV analysis" (PDF). SF Usual Suspects. pp. 11–12. Archived from the original (PDF) on 2013-10-20. Retrieved September 15, 2013. ^ Bay City News (September 12, 2013). "Supervisor David Chiu announces his candidacy for California assembly". San Francisco Examiner. Retrieved September 15, 2013. ^ Lagos, Marisa (January 22, 2014). "Chiu raises $450,000 for Assembly race, says poll shows him ahead". San Francisco Chronicle. Retrieved July 22, 2015. ^ a b Secretary of State of California. "Statement of Vote: June 3, 2014 Statewide Direct Primary Election - State Assemblymember" (PDF). Retrieved July 22, 2015. ^ Lagos, Marisa (November 6, 2014). "Chiu wins Assembly race after Campos concedes". San Francisco Chronicle. Retrieved July 22, 2015. ^ White, Jeremy B. (November 25, 2014). "California Assembly Speaker Toni Atkins announces leadership team". Sacramento Bee. Retrieved July 22, 2015.